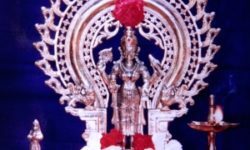 The Temple was miraculously discovered in the nearby forest in completely deteriorated condition by a saintly person in the year 2001. 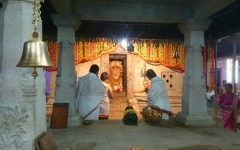 Later, it was then renovated under the divine guidance of Sri Sri Sri Raghaveshwara Bharati Swamiji, Hosanagara of Gokarnamandala Mandala Shankara Peetam and Brahmakalashotsavam of the newly built temple was done in Jan 2005. 4. Installing New Dieties-Daivas Outside the Temple.